For many families, Thanksgiving is all about traditions. Going to grandma’s house, preparing the turkey, and watching football tend to be staples of this holiday. Wouldn’t it be nice, though, to avoid the stress of cooking and cleaning and actually relax this Thanksgiving? More Americans are dining at a restaurant on Thanksgiving than ever before. At first thought, it might seem silly to stray from tradition. However, dining out could be a much-needed change of pace on this usually hectic day. Try as you might, there are times when life gets in the way of attending Thanksgiving dinner. Whether it’s work, a nasty snowstorm, or something else, things happen that throw a wrench into your holiday plans. But just because you can’t make the family dinner doesn’t mean you can’t have a nice time. 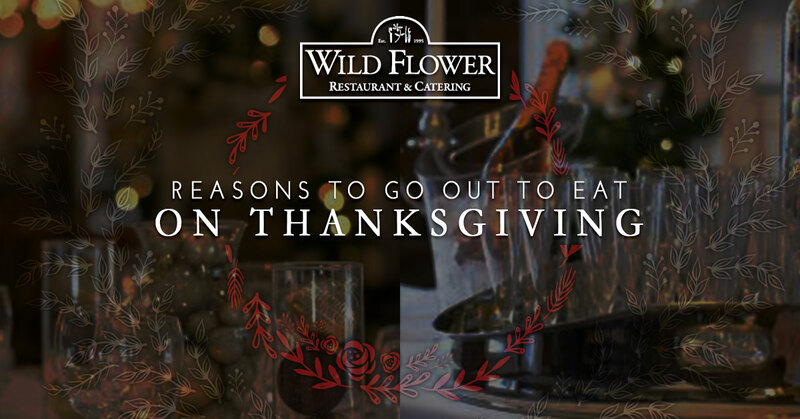 We are proud to announce that Wild Flower Restaurant is open for Thanksgiving! Join us for a dinner that features all the classics in addition to a few things you probably wouldn’t expect with this holiday. You’re far too familiar with the stress that builds during large Thanksgiving get-togethers. Sure, you can try to ignore Uncle Bob and Aunt Marsha arguing over how the mashed potatoes turned out. And yes, you can attempt to brush off the fact that grandma’s stove isn’t working quite right. What we’re getting at is that Thanksgiving dinners usually carry their fair share of stress. That’s why you should consider a family outing to a restaurant. You get to enjoy a delicious, festive meal in a relaxed setting. Who wouldn’t opt for that? Perhaps you know in advance that you will be thousands of miles from home over Thanksgiving. If that’s the case, look around the area to see which spots are open for Turkey Day. This may just turn out to be a fun, memorable part of your holiday experience on the road. Lots of families have loved ones with mobility and/or health concerns. Unfortunately, your house might be stressful or uncomfortable for them to navigate. Booking a reservation at a restaurant allows the entire family to come together without having to fret over stairs, small entryways, etc. The costs to prepare a Thanksgiving feast add up in a hurry. When you account for the turkey, stuffing, mashed potatoes, cranberry sauce, rolls, salad, and pies, the final cost could be exorbitant for one person. Don’t forget about the mounds of leftovers that probably get tossed a few days later, anyway. Believe it or not, some local restaurants offer incredible Thanksgiving buffets starting at around $30 per person. Who says that a tasty holiday meal has to break the bank? This year, why not treat yourself to a delicious, relaxing, and memorable Thanksgiving dinner? Contact Wild Flower Restaurant in St. Louis for more details.